I'm still working on Ann. Every time I start to feel a little bored, I pull up Margaret's beautiful framed finish (scroll down) for inspiration. That tree took forever and I'm so glad to be past it! I'm a little over a third done. I'm really going to try to stick with it. We'll see how long it will last - I'm already feeling the urge to move on. It's gorgeous! Keep up the fantastic work! It's beautiful! Hang in there, you can do it! I just noticed you live in SC - I used to live in Goose Creek!! It's so pretty... you're inspiring me to get back to my Ann. Keep going!! It looks so beautiful! Keep going it looks amazing! I love the border on this one. So, so pretty. You'll finish in no time! I agree with you about inspiration ... that Margaret is something. Lovely work Nicole and the progress is inspirationally beautiful. Looks great, Nicole! Trees are always a pain, aren't they? lol! You accomplished quite a lot from Thur to Wed. Good Deal! This is so beautiful. I'd never want to put that down! One of my stitching friends has adopted "inch by inch" when working on big projects, and, in fact stitched a little inch worm next to her name on her most recent big sampler finish. Great progress on your cross stitch. Its just stunning! And, I know Margaret's gives you such wonderful inspiration to stick with it.....You have made SO much progress! I am hankering to start another sampler now that SEB is done...I am thinking about a Threads of Gold oldie but goodie....we will see! When the page opened and I saw that photo, I almost gasped. GORG E O U S.
Stunning work -trees may be tedious-but well worth it-everything looks great! What about giving yourself a small "reward" piece? After doing x amount, work on the other for a bit...gorgeous work! I really love the colors on this piece, Nicole - you are coming along beautifully! You can do it!! It will be so gorgeous when finished. Hang in there. Keep on going! It's so beautiful!! You've made wonderful progress, and she is SO beautiful! She's really looking beautiful! Keep going! I was so happy to have the tree done when I worked on Ann that I put it down for a few days and did something else - that guy was trying to confuse me a few times. Love your work, it'll be worth it when we finish and can share! Gorgeous, Nicole! You are really making good progress, too. 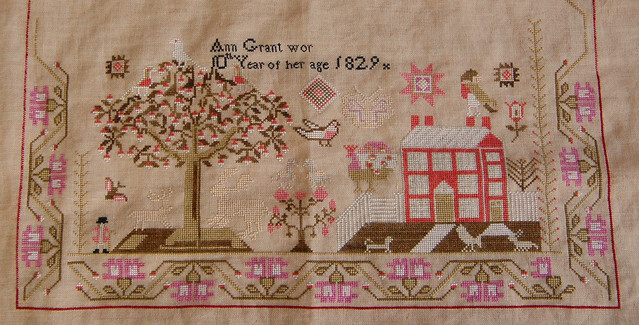 Now I want to hurry up with my projects so I can start Ann G.
It's so much fun to start something new! Your piece is just beautiful. That trees is just gorgeous. Can't wait to see more! Oh, it's absolutely stunning! All that time spent on the tree has paid off because it looks gorgeous ! Great progress, try and hang in there. At least you don't have a deadline like the piece I am stitching for my daughters wedding...aghh!! Just Beautiful! I love the colors. You have made a lot of progress in a couple of days. I am cheering you on! But look at how much you have finished in just 6 days! Your needle just flies through the fabric! OMG, your Ann is just swoon worthy! Just beautiful!!! Ann is simply gorgeous!! I'm really loving all the "Ann" samplers out there!! This one is a must I think for me!! That tree, although large, must have been so satisfying to complete! It's glorious!! Great progress, you know it will be worth the perseverance when you finish. It will look gorgeous. Stick with it! You'll be so glad you did. Lovely so far. Can't wait to see more progress. Ann is looking beautiful, you are doing such a great job. Another design in my list to get done, one day!